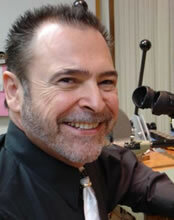 Gary L. Smith is recognized as a master goldsmith, specializing in the identification and authentication, as well as the repair and restoration of antique jewelry and artifacts. He is an accredited senior appraiser with the American Society of Appraisers with the designation of a Master Gemologist Appraiser, and is this countries first and foremost forensic gemologist. In addition to his many degrees and designations, he has over 40 years of experience as an internationally recognized teacher, lecturer, and appraiser of gems and jewelry for private clientele, banks, insurance companies, legal firms, and the State of Pennsylvania Treasury Department. He is an instructor for the American Society of Appraisers, Joyce Jonas & Associates, Inc. (Jewelry Camp), the International Society of Appraisers, American Gem Society, St. John's University, Adelphia University, Hofstra University, and others.